1. For donuts: In medium saucepan, melt ½ tablespoon butter with vanilla bean. When fragrant, add potatoes and ½ cup sugar; add milk to cover. Cook over medium heat until tender. 2. In small bowl, combine chocolates, cocoa powder and remaining softened butter. Place bowl over potatoes in pot to create a double boiler, to melt chocolates. 3. When potatoes are cooked and chocolate is melted, drain potatoes and set chocolate aside. Transfer potatoes to sheet tray; let stand 8 to 10 minutes to cool and allow liquid to evaporate. 4. Meanwhile, in mixer bowl with mixer at high speed, beat eggs and ¾ cup sugar until ribbon state. In separate bowl, combine buttermilk and sour cream. 5. In large bowl, using a spatula, combine melted chocolate, buttermilk-sour cream mixture and egg-sugar mixture until it resembles chocolate pudding, with a sheen. 6. In another bowl, combine flours, baking powder and baking soda. 7. When potatoes are dry, push potatoes through a food mill. Mix milled potatoes into chocolate mixture, then add flour mixture. Mix ingredients together until dough forms, using mixer and hands; ingredients should be well-blended. 8. Roll dough out of bowl onto half sheet tray. It should have a nice sheen and not be too sticky. Roll dough into 45 to 50 small, golf-size balls. 9. Heat oil in deep fryer to 350 F. Fry donut balls in batches for 6 minutes. Meanwhile, combine remaining 1 cup sugar with cinnamon in a shallow bowl. Allow donuts to cool for 30 seconds, then toss in the cinnamon-sugar mixture. 10. For creme anglaise, combine milk, heavy cream, ½ cup sugar and vanilla in saucepan. Place on induction burner set to 220 to 250 F; stir occasionally. 11. In a mixer, whip egg yolks and remaining ½ cup sugar to soft peaks (yolk will be lighter yellow in color and you should see lines in it when pulling out whisk attachment). When milk mixture reaches 195 to 205 F, temper it by stirring a little into yolks, then more the second time. Pour tempered yolks back into saucepan and bring up to 178 to 180 F.
12. Quickly remove mixture from saucepan and strain through a chinois into a large bowl set in an ice bath. Reserve for serving. 13. 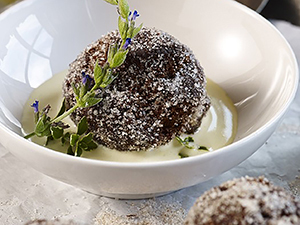 To serve, pour a little creme anglaise into dishes and top with donuts.